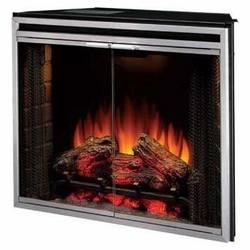 This beautiful, mantel enhancing, front frame is easy to swap out and available for purchase with your new Fire F/X Series 33 Electric Fireplace Insert. This unit is designed to be fitted in to a custom opening, it also fits in to many of our free standing mantels. Regular 110v electrical outlet needed. Indoor use only. Twin-Star International, Inc warrants that your new ClassicFlame Electric Fireplace is free from manufacturing and material defects for a period of ten years from date of purchase. This is subject to the following conditions & limitations. • ClassicFlame Service & Support: ClassicFlame offers toll-free technical support should you need assistance. In accordance with their 10-year limited warranty, ClassicFlame will provide you with any necessary replacement parts or accessories. • Why ClassicFlame?ClassicFlame Electric Fireplace Mantels have won numerous awards for their design excellence and commitment to using only the finest quality hardwood solids and hand selected furniture hardwood veneers. ClassicFlame Electric Fireplaces offer realistic flame effect with five flame & heat settings. Glowing logs and ember bed look realistic on or off. Thermostat controls room temperature automatically.When you choose ClassicFlame you can be assured you’re getting the finest furniture in the electric fireplace industry. At the moment we are offering Free Shipping on all of our products our products The free shipping offer is only for the for the lower 48 US states only, if you are in any other area call 1 305 830 9430 or 1 800 901 6450 or e-mail sales@directelectricfireplaces.com for a quote. Soon after placing your order, you will receive an email to let you know we have received it, if you have paid using Paypal or Google Checkout you will also receive an e-mail from them confirming your payment.